All for Villages is a Californian non-profit organisation that started in 2005, after the 2004 Tsunami tragedy in Southern Thailand. Established by Amanda de Normanville and Gary M. Soden from California, All for Villages has projects in Khao Lak, Phang Nga; the Thai region most affected by the devastating 2004 Tsunami tragedy that struck the Andaman Sea off the west coast of Thailand. In 2014 we commenced a number of projects on Koh Payam, Ranong Province. 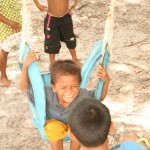 Education & Community Support on Koh Phayam, including working closely with the Moken Sea Gypsy People. Two HIV Outreach Programs & one program to help the poor which operate from Takuapa Hospital. 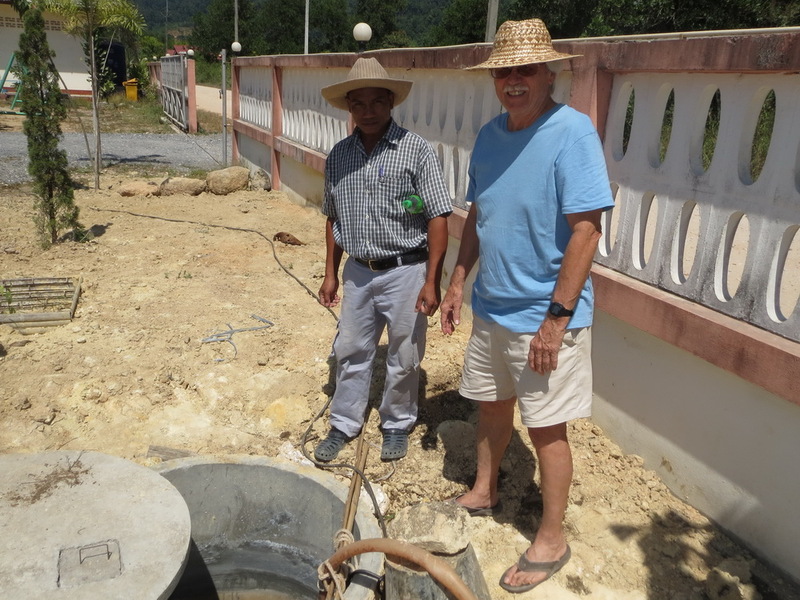 Clean water projects; Burmese School in Kuak Khak (Khao Lak area) & Moken Sea Gypsy Community on Koh Phayam. Supporting families on an as needed basis. This includes: food, help after floods, school lunches & computers for students. 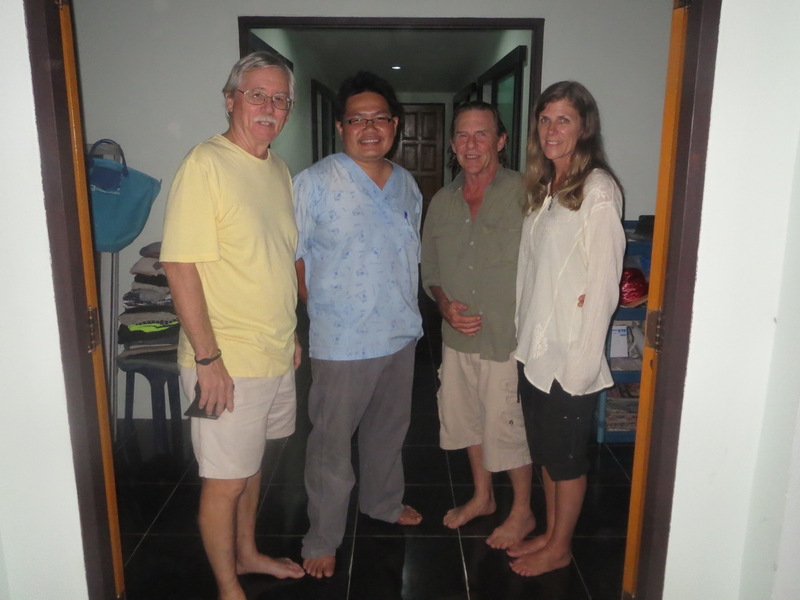 When Amanda and Gary are not home in California, they are in Thailand volunteering their time and resources to All for Villages, usually 5 to 6 months each year. We first came to Thailand in 2000 and tried to create a sanctuary for elephants, but unfortunately that was not to be. Meanwhile we fell in love with the people, the elephants, Buddhism and the culture. By 2004 we were coming twice a year, trying to move the elephant project forward. Then the Tsunami hit. Gary and I returned after Tsunami and volunteered for 2 months at the Tsunami Volunteer Centre in Khao Lak, the most devastated region of Thailand. This extraordinary experience had a profound affect on both of us. We are incorporated in California as a 501(c)3 non-profit organisation and as such all donations from the US are tax deductible. 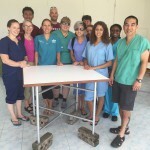 All the Board Members as well as our Team on the ground in Thailand are volunteers. Visiting “Anne” at the local temple. We have a home near the village of Baan Nam Khem, where we spend up to 6 months a year, from July to September and again, from January until March. When we are back in California, are advocates against Greyhound racing and and foster parents for greyhounds discarded by the tracks because they no longer make money for their owners. Amanda worked in a shelter for teenagers, volunteered with black prisoners & at a shelter for battered women. Later she became a staff member at the women’s shelter. Then the AIDS epidemic hit and at the end of the 80’s Amanda trained to be a volunteer to support people with HIV / AIDS. Later she gained her Master’s Degree and MFT License. I was born loving animals and couldn’t bear any longer seeing these starving and injured dogs, many with mange and terrible skin diseases; on the streets, in packs on the beaches and at the Temples. One day I went to our local Fresh Market and saw the ugliest dog I’d ever seen, cringing around the outside. No hair, one swollen infected eye, balls hanging down to the ground, well nearly! An outcast. I went over and talked to him, and stroked the skin of his head. Well, he became ecstatic with Joy! Twirling, jumping, smiling … little thing. Every time I would come to the Market, he’d come running. He’d hear my voice. ‘My Boy’, I’d say. Everyone thought I was mad of course, but hopefully it sowed a seed in their minds that dogs are sensitive, feeling beings with emotions of fear, joy, and pain, just like us. He propelled me to do something! Eventually I found a vet who also saw the overpopulation of street dogs as a problem, and recognized the need for a sterilization program in the area. While in the south we also found a need at the local hospital, and with Dr. Chalerm Chai we have a program for the poor. Later we heard of need for HIV prevention help for some pregnant women … then the Burmese school, and you can read about them here on the website. Gary was born and raised in California. He attended University of California, Berkeley and has a Bachelor of Science in Mechanical Engineering and Master Degree in International Business and Economics. In 1986, he and Amanda started “Clear Heart Drilling, Inc.”, a small northern California drilling company. It specializes in geotechnical and environmental drilling and installs vertical and horizontal water wells. These skills were used after the Tsunami starting in February 2005 to help people with their wells. Clean water is so important. George has made several visits to Thailand and now holds his retirement visa here in Thailand . 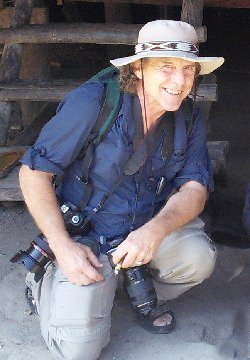 George was a business owner in the printing/publishing business in Guerneville California, on the Russian River, for 40 years and is an award winning photographer, showing beautiful images of Thailand and Myanmar in a local art gallery. Today, Geroge is retired but continues to volunteer and support both is local community and All for Villages. He has served on the boards of directors for non profit organizations having to do with fund raising for AIDS relief groups and environmental protection interests. He was honored by the US Environmental Protection Agency for work in stream restoration and watershed habitat protection projects. He has served as a volunteer elected official for community redevelopment, and has been chairperson on the infrastructure subcommittee, helping to improve the quality of living in his local area. George has been a certified kayak instructor and volunteer docent and roving naturalist for California State Parks,leading educational trips for children and adults on the Russian River and Sonoma Coast State Beaches. It became very clear to me that village issues in Thailand are critical to the well being of the residents. The issue of street dogs and cats is one of the most obvious problems that needs attention. When I learned of All for Villages, and its projects, including Dr Sam’s clinic and the Burmese Refugee school, I had to see for myself. I visited the animal clinic on several occasions and visited the School as well. There is so much that All for Villages can do with donations and actually working “hands on” for these people in need. So I gladly accepted a board membership. I have spent much of my life living overseas experiencing other countries and cultures, so I would have to say my passion is to travel; guess at a young age wasn’t ready to settle down. I have been travelling to Thailand for over 30 years; returning almost every year as it was always my happy holiday place; a break from my hectic life in Australia. Since 1992 I ran my own business which operated 7 days a week as well as volunteering predominantly helping young people living on the streets in our local community. I was also a full time foster carer for young adults who were unable to remain in their family home. I visited Khao Lak in July, 2004 and really enjoyed relaxing on the then quite empty beaches and touring the local villages. Imagine my shock when the images of Tsunami were beamed out live in our living rooms. I remember sitting with some friends and crying, thinking, “Oh how could this happen, why didn’t they know”. I was numb with shock as was the rest of the world. We immediately started organizing fundraising events in our local community and I traveled back to Khao Lak area briefly in 2005 to see first hand what was needed. In January 2006 I again came to visit the area and it was then I decided I would love to return and volunteer on a more permanent basis. I returned to Australia, sold my business, packed up my life and moved to Thailand in August, 2006. I spent the first year and a half living and volunteering in an post-tsunami home for 120 children directly affected by the tsunami. This had a profound effect on me; I realized how much we take for granted and how much you actually need to be happy and content with your life. After meeting Amanda and Gary on the beach in Nam Khem, I began spending more time with them and learning about All for Villages and the incredible work they were doing. In 2008 I spent 5 months in Cambodia supporting a grass roots project, helping set up a small learning centre and library for disadvantaged remote children. It was an incredible experience but I really missed Thailand; the beaches, the people and the overall atmosphere. When I returned, I contacted Amanda and Gary. Our friendship grew and it was then we began working more closely together to spread the word about All for Villages and what we could offer. In 2015, I was very happy to accept a position on the Board of All for Villages. I would have to say, its been the most rewarding experience of my life and I will continue to volunteer my time and support our community. Our daughter, Marina, has recently joined our Board and we welcome her to our Team. Born and raised in Northern California, I grew up on the Russian River with my parents, who were my first role models in demonstrating random acts of kindness, compassion, and the importance of helping those who are less fortunate, including animals! While I attended High School, my dad founded Clear Heart Construction, while my mother has worked her entire life as an advocate for those in need. Whether it was battered women, people with HIV, or animals who were being abused, her love for people and animals was the foundation of our family, and steered the course which led us to All For Villages. My first trip to Thailand was in 1996, right after graduating from college at UC Santa Barbara. My friend and I set off on a 4 month trip to backpack along the South Pacific and South East Asia, where we could experience life in the countries we had dreamed of visiting. We set off with little more than our overloaded packs, round the world tickets, a general idea of where to go, and loose plan of what to do when we got there. 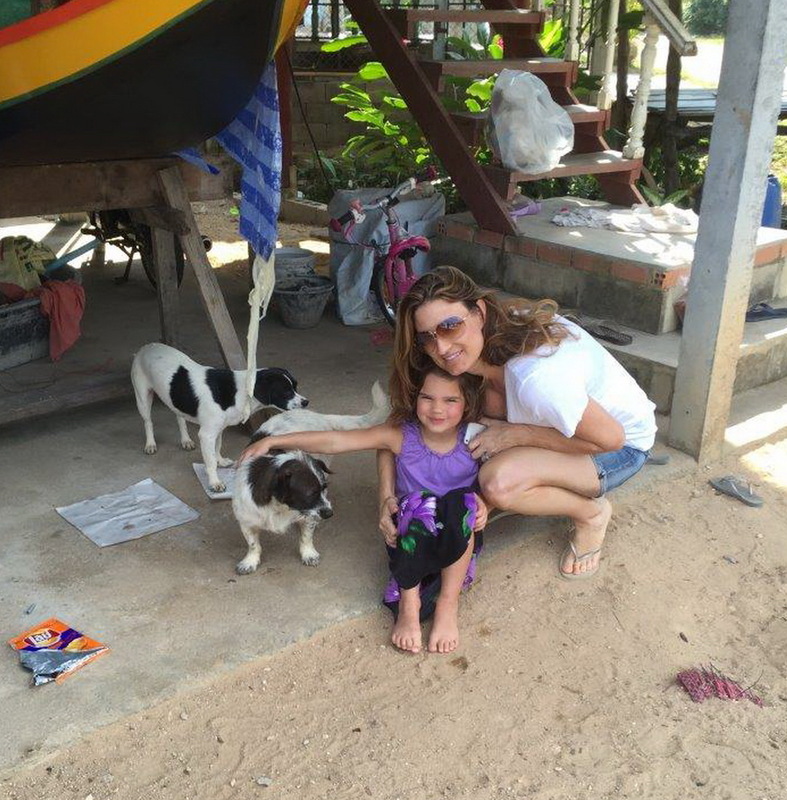 It was an experience of a lifetime and remains the pivotal point when I fell in love with Thailand, the Thai people, and all that this special country has to offer. At that time, my folks had not yet been to Thailand but I knew that they must go there, that they would fall in love as I had, and so the seed was planted. Just as I had predicted, it was love at first sight for them too but I could never have predicted that it would become a second home, and a place where all of us could do some good in this world. After the devastating Tsunami in 2004, my parents experienced firsthand the plight of the villagers and animals whose lives were changed forever. It was at this time that AVF was founded. Just 2 to 3 years later we were fortunate to meet Fiona Parsons, who much like us felt the pull to do something to help. Now a dear friend and board member, Fiona has worked tirelessly to build and expand on the efforts All for Villages set forth after the Tsunami hit. It’s amazing to see what a small group of people can do when they band together to help others, and truly inspiring to see how far we’ve come over the years. Upon return from my travels, I lived in San Francisco and worked predominantly in Sales and Marketing before meeting my Husband and moving to Marin County where we live happily with our 6 year old daughter Bailey. As a relatively new mother, it is so important for me to raise Bailey with the same introduction to kindness and compassion, and share with her the passion my family has for serving others. It is the most rewarding experience to make a difference in the lives of others.